The Girard Pig-Valve Pigs are specifically designed for use in pig launching and receiving valves. They are available in open cell polyurethane foam, solid cast urethane or even solid steel body with polyurethane wear parts. To handle the varying pipeline applications these pig are available in multiple configurations included cup & disc, bi-directional and wire brushes. Girard Pig-Valve Pigs are made of the highest quality polyurethane elastomer available and feature one-piece solid polyurethane construction so no assembly is necessary. Our Pig-Valve Pigs are engineered for longer wear and abrasion resistance. They are versatile and an be run in LPG, crude oil, natural gas, saltwater and product lines as well as liquid removal. 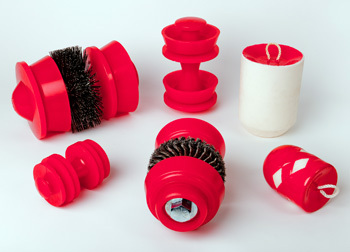 THE TURBO FLOW: Cup & Disc Combination Urethane Pigs with Optional Brushes. TURBO FLOW BD: Multi Disc Urethane Pigs. PV POLLY PIG: Medium Density Foam Pigs. PV MANDREL PIG: 2 Cup Steel Body Brush Pigs.